Panzerjager (tank hunter or destroyer) Hornisse (Hornet) or Nashorn (Rhino) Sonderkraftfahrtzeug (military special purpose vehicle) SdKfz 164 receives communication from a dispatch rider. By December 1941 it was obvious that only heavy artillery could defeat the armor of the Soviet T-34. While designs for new tanks and tank destroyers progressed, a 88mm Pak 43 gun was fitted to a new chassis design that used components from both panzer III and panzer IV tanks. With an under-armored, high silhouette, soft steel open box for the gun, the Hornisse's crews suffered through all the elements. Reichchancellor Adolf Hitler ordered a second version, with minor changes, that became the main production version. 474 Nashorns an 20 Hornisses were made between February 1943 and March 1945, designed by Alkett and produced by Deutsche Eisenwerke in Tieplitz-Schonau. 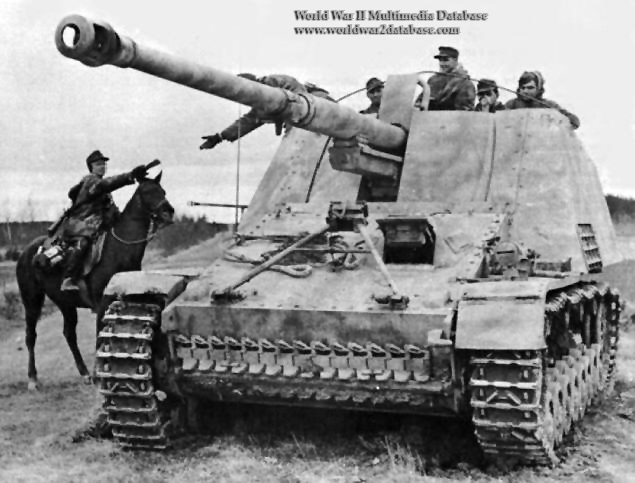 The first 100 units equipped the 655th schwere Panzerjägerabteilung on May 12, 1943 in time for the Kursk Offensive. While under-armored and open toped, they could fight heavy tanks like the T-34 and M-26 Pershing. Six schwere Panzerjager Abteilungens (560, 655, 525, 93, 519 and 88) were engaged in combat during the war. Each unit was equipped with 30 Nashorns. Date and location estimated.